Peru's health ministry has dispatched emergency medical teams to the Amazon rainforest to stanch an outbreak of rabid vampire bats. So far 500+ people have been attacked by the bats, and four have been killed. Four children in the Awajun indigenous tribe died after being bitten by the bloodsucking mammals. Health workers have given rabies vaccine to more than 500 people who have also been attacked. 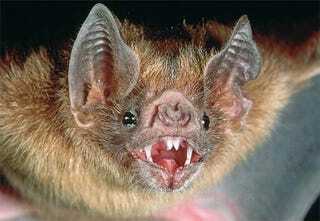 Some experts have linked mass vampire bat attacks on people in the Amazon to deforestation. The rabies outbreak is focused on the community of Urakusa in the north-eastern Peruvian Amazon, close to the border with Ecuador. Vampire bats normally feed on the blood of sleeping horses and cows, but attacks on humans are not an entirely uncommon occurrence.